Starting in February, every Wednesday at 7pm I would meet up with a running group in Union Square at the Jack Rabbit store. Led by our trusty running coach Gabe, we would run over to Madison Square Park and do various exercises and running drills for an hour. This running group was organized by NYC Social, which is a really cool company that organizes sports teams in NYC for people to make new friends, have fun, and get some exercise. I didn’t know when I signed up, but the goal of the running group was to prepare runners for the Spartan Race Citi Field held on April 12th & 13th. Not everyone in the running group chose to race, but I thought “Why not? 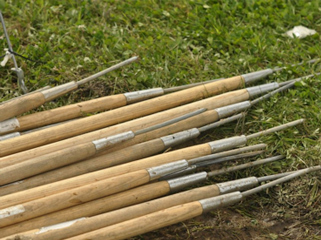 It looks like a fun experience.” Fortunately, my instincts were on the money. 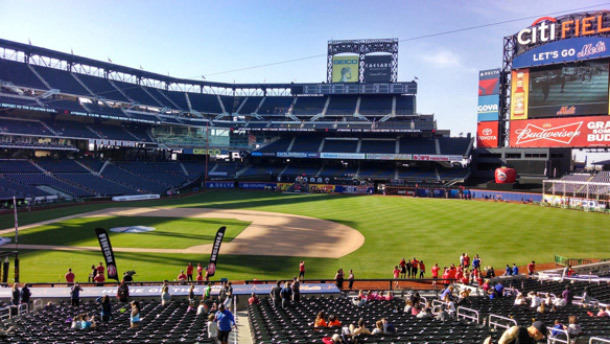 What is the Spartan Race Citi Field? 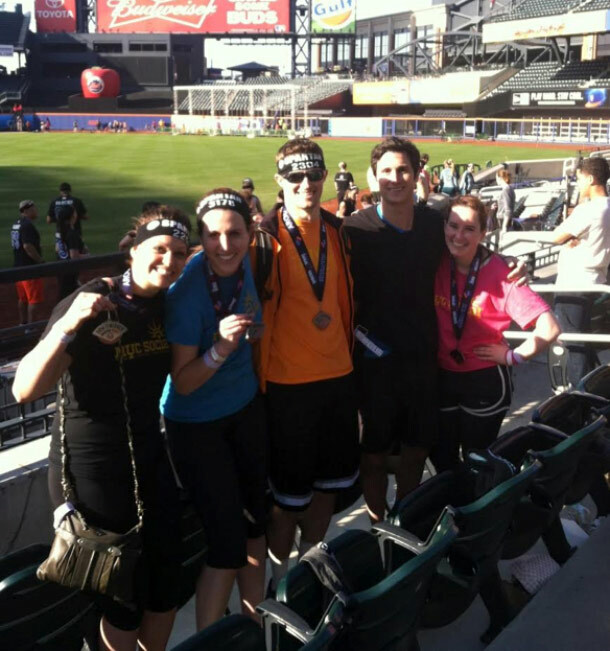 The Spartan Race Citi Field is a 3.1 mile obstacle course race that is comprised of 21 obstacles. The race is held at Citi Field, which is the Mets baseball stadium in Queens, NY. First conceived in 2001, the Spartan Race (now officially called Reebok Spartan Race) has grown into one of the most popular obstacle course races with races held around the world. 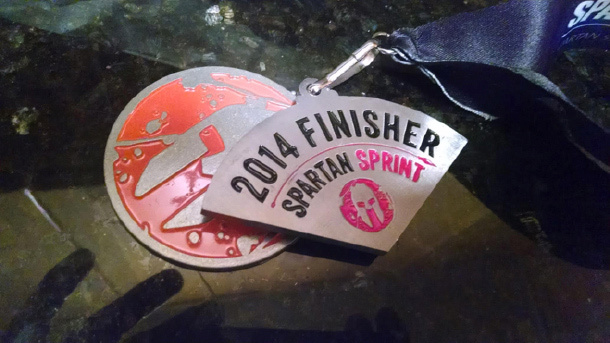 Spartan Sprint – 3 miles. 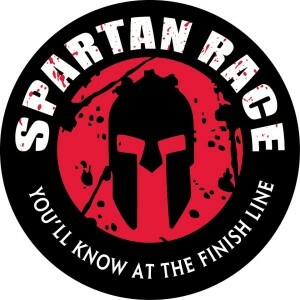 The Citi Field race is technically a Spartan Sprint. Most Spartan races are known for mud and hills. The Citi Field race does not have any mud or hills. Instead, it has lots of stairs. You don’t need a group to race, but it’s more fun to race with friends. The team minimum is 4 people. There were some teams with 15 people comprised of men and women, and others that were smaller comprised of just men, or women. With some groups everyone raced together, others spread apart. I had a running partner with me, which made the race more fun as we were able to experience it together. Ideally, your running partner will be in similar shape to you. The one drawback is you have to wait for each other if one of you fails an obstacle and is required to do burpees. If you are very competitive and in great shape, you should definitely sign up for the Elite wave, which is the first wave of five throughout the day. For everyone else, the Spartan Race Citi Field is more of an obstacle course than a race. Invariably, there will be racers in front of you who slow your progress. Expect this going into the race. Not everyone is in awesome shape; there is a wide range of fitness levels. In addition, it was a ton of fun being on the Mets’ baseball field and in the visitors’ locker room where one of the challenges was located. While you will be working hard, it’s worth stopping for a second to enjoy it. If you miss any obstacle, you are required to do 30 burpees, which is A LOT of burpees. A burpee (aka squat thrust) is best known as a grueling military exercise, or punishment. From a standing position, you must drop down to the ground so your chest is touching the ground. You then push yourself all the way back up and jump off the ground. There are a lot of theories as to how to do a burpee efficiently so it takes as little energy as possible. Either way, you should definitely be prepared for them. The most tired I was in the race was after I missed the spear throw and had to do 30 burpees. Brutal. While 3 miles isn’t a short race, it feels like you are doing less running and more obstacles and stairs. In other words, just running around a track for a few miles is not good training prep for this race. I have more training tips below. 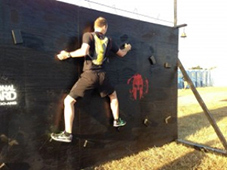 There are 21 obstacles you will need to complete in order to finish the race. Most of the obstacles were subtly different for men and women, such as the amount of weight that needed to be carried. Unfortunately, the spear throw was right after the Traverse Wall (more on that obstacle below), so your forearms may be burning while you throw the spear. If you don’t have proper rope climbing mechanics, unless you can do pull ups with ease, you will have a tough time with the rope climb. The key is to use the “S-Hook” method to help provide your feet with a foundation as you climb the rope. You start out at one end of a wall and must get to the other end without touching the ground. The problem is you only have small wooden blocks a couple inches thick to hold on to. If you keep your body close to the wall, it makes it easier, but not easy. Good grip strength will help with this challenge. After hopping up several flights of stairs, trying to jump rope with a 3-inch thick rope is not easy. You must do 50 revolutions. You will likely need to take a short break every 10 reps, or so. There were a lot of walls to climb that ranged from 5 feet to around 7 feet high. This is where having a partner can help. If you can easily do pull ups, the wall climb will not be too challenging. Other obstacles included farmers carries with water jugs, rope pull with a weight on the end, sandbag carries up and down stairs, and hopping up several flights of stairs with your legs bound. 1) Lose as Much Body Fat as Possible – the more body fat you lose, the faster you will be and the easier the obstacles will be. Every ounce of fat you lose will improve your power to weight ratio. For much more on this topic, read How Body Fat Affects Athletic Performance. 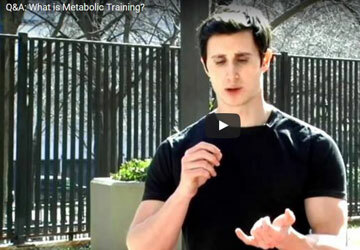 2) Focus on Anaerobic Exercise – Anaerobic exercise is short in duration and intense, typically under 2-3 minutes. Jogging for 5 miles a few times per week is not a smart training plan. Focusing on sprinting, running up hills, running up stairs, with short rest periods will enhance your aerobic capacity more than jogging and will be far better preparation for the race. 3) Shoot For A Minimum of 3 Workouts / Week For A Month Before The Race – You don’t need to workout every day, but a few times per week will ensure that you are working out just about every other day. Committing to a regular workout routine for the month before will help you finish the race and still feel good the next day. Jump Rope – improving the muscular endurance of your calves and your overall plyometric strength will help out a lot. The next day after the race, only my calves were really sore. Farmers Walks – hold on to a dumbbell or kettlebell in each hand and walk for 25-50 meters without dropping the weight. Start with 30% of your body weight in each hand and work up. Go for 200 meters total. Farmers walks are an excellent grip strength and total body exercise. You’ll thank me after you finish the race. Push Ups / Pull Ups – For ladies, you can try a dead hang (hanging up at the top of a pull up bar for as long as you can – ideally 20+ seconds). For guys, mastering your bodyweight will make the obstacles much easier. Shoot for 10+ pull ups and 30+ push ups (ideally 50 push ups) at the end of your training. Sprints – You can do hill sprints, running up stairs, or sprints at the track, but sprinting is an incredible way to boost your aerobic capacity. Jogging doesn’t cut it. Just doing these 5 exercises can more than prepare you for the race. No need to make your workout routine overly complicated. We got lucky with a fantastic Spring day. Everyone who finishes gets a medal. A lot teams had matching t-shirts. I even saw the occasional super hero costume. Sunblock – I stupidly forgot to put on sunblock. Bring it with you, or put it on before you go. Long sleeve shirt / windbreaker – It will get cold later in the day if you stay. Keep this in your bag. Bag – you can keep your keys / wallet etc. in your bag. The bag check is easy, organized, and secure. Do I need to have a group? Nope, you don’t need to run in a group. If you can persuade some of your friends to join you, you’ll have even more fun. The top finishers are done in around 40 minutes. The slowest are done in an hour and change. Show up a good 45 minutes before your start so you can find your friends, get your bib #, check your bag, and not be rushed. 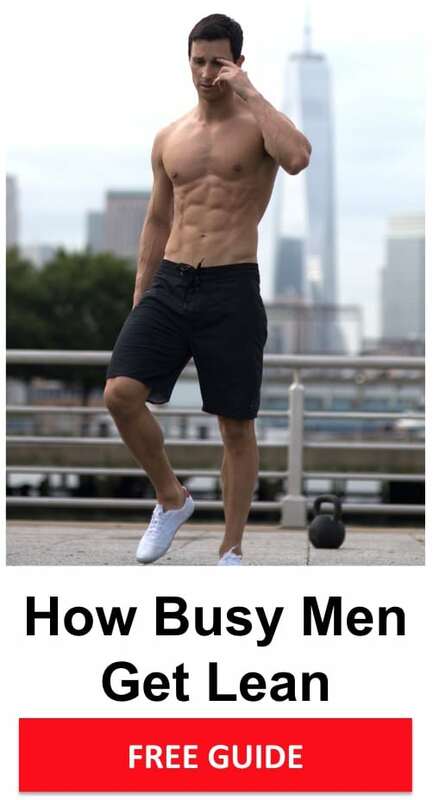 Do I have to be in amazing shape to do it? No. 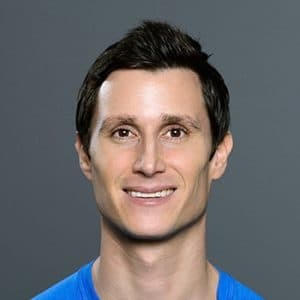 If you can run a few miles consecutively without stopping and can complete 50 burpees consecutively in a couple of minutes, you should do just fine. There was a wide range of fitness levels. Of course, you should exercise consistently in the weeks leading up to the race. If you raced this weekend, what advice would you give someone who hasn’t done it yet?